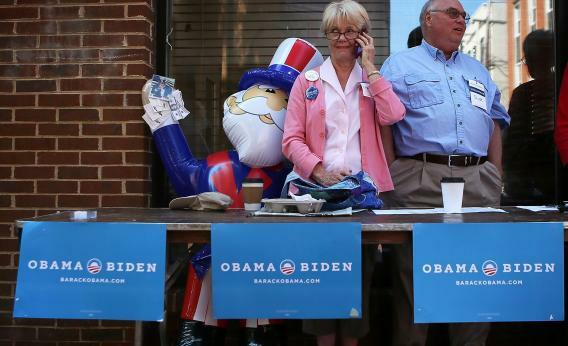 Obama’s Victory: How the Democrats, burned by Karl Rove, became the party of competent campaigning. How Democrats became the party of effective campaigning—and why the GOP isn’t catching up anytime soon. A polarizing incumbent wins a closely fought but decisive re-election despite mixed public opinion about his first term. His lead was steady and consistent throughout, and he was boosted on Election Day by strong turnout from core constituencies despite suggestions that his supporters could suffer from weakened enthusiasm the second time. The storyline was clear: The president won in large part because of superior tactics and improved technique. In 2004, the incumbent who won that tactical victory was George W. Bush, and as Democrats learned more about his campaign’s successful application of first-generation “microtargeting” procedures, they began to see their opponent’s powers as more mundane than mystical. Five weeks after Bush’s re-election, Washington Post columnist E.J. Dionne diagnosed the Democrats as suffering from “Rove Envy” and described the longing the party had “for the strategic clarity and organizational acumen” Republicans showed in campaigns. Indeed Bush’s win had ratified what both sides recognized as a long-standing culture gap between the parties. Republicans were the party that was competent about politics, bringing the discipline of the corporate suite to the campaign war room. Democrats, who had resigned themselves to the reality of the Will Rogers quip about not being “an organized political party,” committed themselves to building a new infrastructure for innovation and collaboration among separate interest groups and rival consultants. Tuesday night’s results testify to many dramatic changes, particularly demographic and ideological ones, that mark life in Obama’s America. But within the practice of politics, no shift seems more dramatic than the role reversal between the two parties on campaigning competence. Today, there is only one direction in which envy can and should be directed: Democrats have proved themselves better—more disciplined, rigorous, serious, and forward-looking—at nearly every aspect of the project of winning elections. After losing even more dramatically in 2008, Republicans acknowledged that Obama’s campaign was tactically superior and technically more advanced than John McCain’s, and the party’s operatives leafed through David Plouffe’s memoir, The Audacity to Win, for clues on what the Democrats did right. (Spoiler alert: The book revealed almost nothing about the mechanics of an Obama campaign.) But that curiosity never translated into serious self-examination. The Republican political class could look at so much else working in Obama’s favor—that candidate’s unique appeal, a broad distaste for Bush, voter anxieties about economic crisis, strategic inconsistencies in McCain’s approach—that few undertook the same self-examination that the electioneering left did in the wake of 2004. But in 2012, a seemingly vulnerable incumbent president’s solid victory will be attributed to tactics, and the other side will surely hustle to catch up. But the innovation terrain in politics has changed over the last eight years, and it will be a lot harder for Republicans to return to parity with their opponents. Concern that the technical supremacy of Rove and his crew would ensure the Democrats’ future as a minority party drove consultants who usually competed with one another to collaborate on previously unimaginable research projects. Major donors like George Soros decided not to focus their funding on campaigns to win single elections, as they had in the hopes of beating Bush in 2004, but instead to seed institutions committed to learning how to run better campaigns. Liberals, generally in awe of the success that Republicans had during the 1980s and 1990s in building a think-tank and media infrastructure to disseminate conservative ideas, responded by building a vast left-wing campaign research culture through groups like the Analyst Institute (devoted to scientific experimentation), Catalist (a common voter-data resource), and the New Organizing Institute (improved field tactics). With an eager pool of academic collaborators in political science, behavioral psychology, and economics linking up with curious political operatives and hacks, the left has birthed an unexpected subculture. It now contains a full-fledged electioneering intelligentsia, focused on integrating large-scale survey research with randomized experimental methods to isolate particular populations that can be moved by political contact. If Republicans brought consumer data into politics during Bush’s re-election, Democrats are mastering the techniques that give campaigns the ability to understand what actually moves voters. As a result, Democrats are beginning to engage a wider set of questions about what exactly a campaign is capable of accomplishing in an election year: not just how to modify nonvoters’ behavior to get them to the polls, but what exactly can change someone’s mind outside of the artificial confines of a focus group. For Republicans concerned about their prospects as a party able to run successful campaigns in the 21st century, the heartening news should be that this election ended in much the same way that 2004 did. The heartbreak of losing a race many thought was winnable should drive a sclerotic political class to sacrifice their short-term professional priorities for the sake of innovation—and the closeness of the outcome should lead them to invest in methods that help them around the margins in the future. But the gap between the sides may be too large for mere enthusiasm to close it anytime soon.